OXFORD, Miss. 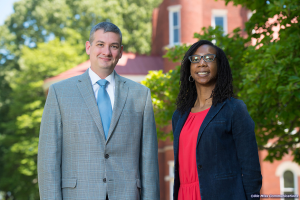 – Two chemistry faculty members in the University of Mississippi’s College of Liberal Arts were recognized for their creative research and scholarly activity during the 2017-18 academic year. Prof. Davita Watkins received the Dr. Mike L. Edmonds New Scholar Award for junior faculty and Prof. Nathan Hammer received the College of Liberal Arts Award for Research, Scholarship and Creative Achievement for senior faculty. “These award recipients are among the very best scholars at the University of Mississippi, and we celebrate their success,” said Charles Hussey, associate dean for research and graduate education and professor of chemistry and biochemistry who served as chair of the selection committee.